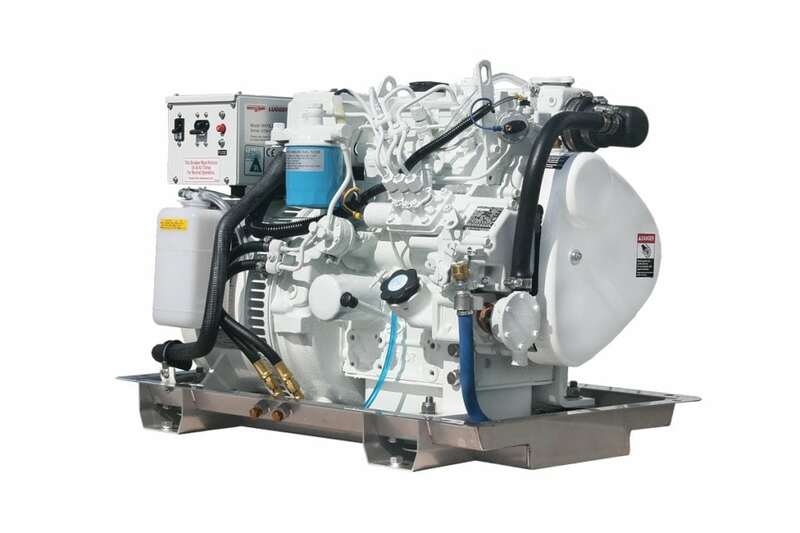 Genset Genius: Keep your generator running strong with these top ten generator tips. Marine generators are beasts of burden, able to toil tirelessly for years with little trouble. Using the right fluids and with proper maintenance, generators keep electricity flowing and allow boats to come to life with electronic gadgets, heaters, and sound systems when the main engines are shut down. Make sure to keep all systems go with these generator tips. It’s easier to keep the generator in shape during your main boating season. Since it is likely is run every time you go out, provided you use the boat on a weekly basis or so, it will keep up. However, if you’re a boat owner who may not run the vessel for weeks or months at a time, rest isn’t good for a generator. Exercise is crucial to keep the unit in shape and well lubricated for when you need it most. and for leaks beneath the generator. 2. Be sure the AC load breaker or switch is turned OFF when starting the generator. 3. Turn OFF the shore power breaker at the dock before switching the generator on if you start at the dock. 4. Change the seawater pump annually before you start your cruising season. 5. If you don’t put a lot of hours on your generator, change the oil and filter twice a year (spring and fall). 6. Dirty exhaust can be prevented by maintaining 40–50% of the generator’s rated kW load or more at all times. 7. If your generator has zincs, inspect them every 90 days until you know how often they need to be changed. 8. Always carry spares for your generator. 9. Service the heat exchanger and replace coolant every 2 years. 10. Inspect the exhaust wet elbow visually once a year. If you’ve changed a fuel filter and are having trouble starting the generator, DON’T crank the starter for more than 60 combined seconds or you could accidentally fill the muffler and flood the engine with seawater. Just drain the muffler and repeat the fuel system priming procedure for your generator. Finding the sweet spot of the generator size and your electrical needs takes a little work. Tally all your AC appliances on a spreadsheet and enter the watt rating. The rating lists how much current the appliance draws and is usually on a UL plate on the appliance or in the manual. The total draw is in kilowatts (kW), 1,000 watts of electricity. One idea is to choose a generator rated from 10 to 25 percent greater than the boat’s average draw. If the load totals 1,500 watts, then a 2kW generator is about right. Because you won’t have all the appliances on at one time, determine what time of day you will have certain ones on simultaneously, such as the hairdryer, microwave, and coffee maker. Then make an electrical needs plan. To help, Cummins offers an online generator sizing tool that leads you through a series of calculations depending on your size and type of boat (cumminsengines.com/marine-generator-sizing-tool). Northern Lights offers a list of Top Ten Generator Tips to keep your generator running well. Highlight this tip on the list: Tip 9: Always carry spares for your generator. At a minimum, carry these spares: fuel filters, one belt, one oil filter, oil, and coolant. In addition, there’s a good tip to follow that’s not on the list. Install a generator that runs on the same fuel type as your main engines. If you have a gasoline-powered boat, buy a gasoline-powered generator. The same goes for diesel. Cummins and Northern Lights are also focusing on reducing generator heat and sound in their new products. At the 2018 Miami International Boat Show, Cummins displayed its new Onan Marine QD series generator platform. It covered a power range from 40kW to 65kW. This product is available in a heat-exchanged or keel-cooled configuration with or without a sound shield, and it can be paralleled providing power for vessels that have large house loads. Northern Lights released its GEM series of sound-attenuated enclosures that attach directly to the base frame to simplify assembly, and the marine-grade aluminum structure creates sound attenuation equal or superior to previous models. Available in either the traditional white powder-coated finish or polished stainless steel, the enclosure is currently available for Northern Lights M673LD3, M673L3 and M773LW3 models. Need more boat generator tips?